We are delighted to have won a Highly Commended award from the Insider Made in the Midlands group. Shortlisted to a group of seven companies – all much bigger than us – we went to the awards ceremony at the Burlington Hotel, Birmingham on Thursday 10 May with hope and anticipation but with little expectation of winning anything against such stiff competition. 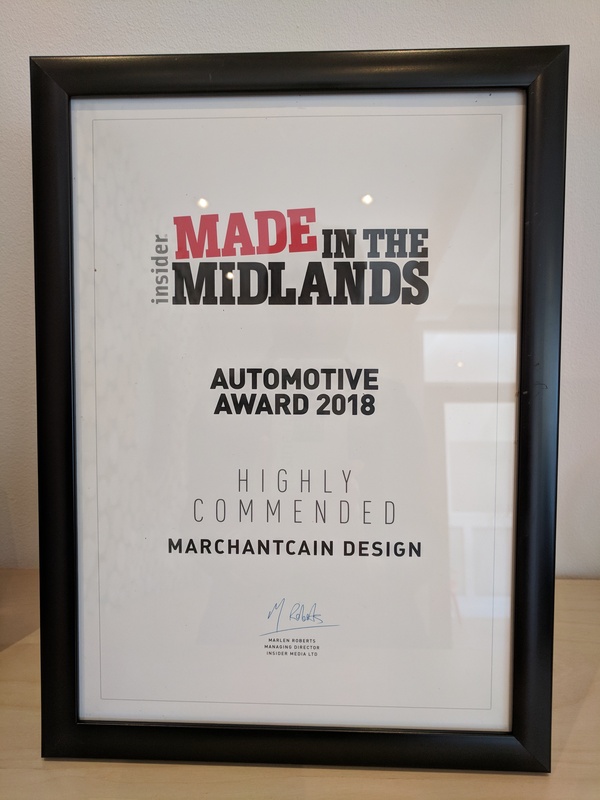 However, we were surprised to be acknowledged as a company going places by being awarded the only Highly Commended in the automotive category, pipped to the post by the huge Liberty Vehicle Technologies. Highly commended awards were not handed out in all categories and we were happy to be joined in that sphere by Aston Martin Lagonda who were also awarded “Highly Commended” in the Manufacturing Apprenticeship Scheme category, beaten by another automotive engineering company, Contechs, based in Warwick. A thoroughly enjoyable evening was improved further by the story telling of Peter Taafe of Tamlite Lighting who inspired us with the story of Thomas Mackie, who founded City Electrical Factors in Shakleton Road, Earlsdon, Coventry in 1951. From just one electrical cable and lighting outlet the company is now a global employer of more than 8000 people, manufacturing its own commercial lighting fittings through Tamlite Lighting and is a £3billion turnover company; the company is still owned and run by the Mackie family. How inspiring is that? Rob Marchant, our Managing Director, posted of our success on LinkedIn on Friday morning and to date (14 May) more than 7000 people have viewed that post. The incredible power of social media! We are looking forward to providing our skill and knowledge to new customers, large and small. We currently have CAD capacity so contact us if you need a couple of quick projects completing with a high level of design engineering skill and expertise.